If you are like me, you use a TON of eye makeup remover. 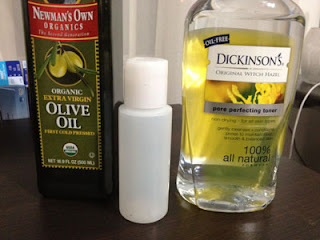 Over the course of these past few years, I found that I was going through those little bottles of eye makeup remover every other month or even sooner that that. The problem is that while there are so many brands out there, many of them sting my eyes or worse yet, do not work until I really rub. Because I, ahem, am getting older, I do not want to tug or pull or even rub around my delicate eye area too much. A few months ago, I decided that there had to be a more natural alternative to these chemical laden eye makeup removers. So I started researching, found a few recipes and tested them out. 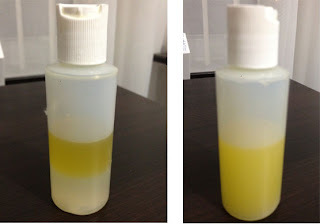 The final outcome, a two ingredient homemade natural eye makeup remover that works like a charm, is inexpensive and is gentle on your eyes. 1. Combine 2oz of Organic Olive Oil and 2oz of Witch Hazel into a small container. I shake the mixture and dispense a small amount on a cotton pad. I then disperse a small amount on a cotton pad. I place the soaked cotton pad on my eye and give it a few seconds for the mixture to dissolve the eye makeup. Then I wipe clean. The mixture does leave a little residue, that I like becuase it adds a little extra moisture around my eye area. As with anything, please test to make sure you are not allergic or sensitive to any of the ingredients above. This recipe works for me and my skin type. I hope that it helps you if you are looking for natural alternatives and ways to green your makeup routine.